Your Morning Cup: Win An Apron! Okay folks. You know I like cooking. And sewing. 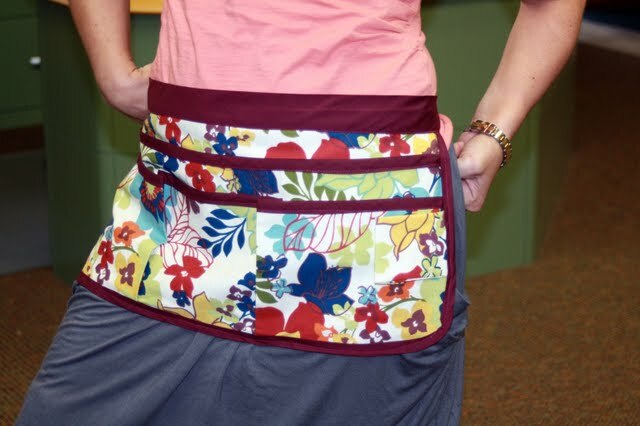 And over on The Giggling Gourmet I've got a page devoted to aprons I sell. But there was a problem. I found out The Giggling Gourmet is some lady in South Africa that has beaten me to it and copyrighted the name! Fiddlesticks! So now I need a name for my little side shop I'm setting up. If you come up with the winning name, you win a free apron! You can submit as many suggestions as you like for multiple chances to win! Update 10/10/2010: I had the thought to include Thursday somewhere. If you head over to our Thursday Farms blog you'll understand. Any suggestions? Leave your suggestion in the comment section on either this post or The Giggling Gourmet to be entered to win your very own ___(you fill in the blank)______ Apron! Deadline is Tuesday, October 12th at midnight. What're ya waiting for? Don't you want one of these? "Kait's Cooking Clothes" very cute aprons! I'd luv to wear when when I visit my daughter's class to decorate cookies! lol my suggestion? "Fiddlesticks!" I don't know, jsut struck me as cute! And the sort of name I'd remember. Plus, you have a great back story for how you choose the name! Kait's Kreations? or Kreated by Kait. I love aprons and use them (almost) daily. i use an apron frequently. I think you ought to just go with "your name dba the giggling gourmet" if you like the name _that much_. However, that name says (to me) that you are selling food, which you are not. So how about 'giggling gourmet goodies'? [I had two others, but they didn't pass the google check]. By the Pretty Apron Strings...?